My first experience with Greenhouse Academy was a bit confusing as I viewed a later episode of it. However, after seeing the first episode I am now much more at ease with the show. This episode introduces siblings Alex and Hayley who recently lost their mother in an accident. Alex applies at Greenhouse Academy, a special school that only allows a select few into one of its two houses - the Ravens and the Eagles. One favors physical achievement and the other favors academics. However, the ending of this episode suggests that there might be more to this story and the mother's accident than meets the eye. The characters are believable, although not remarkable. They are typical of teens that we have seen in other shows and they are all likable in their own way. The talent includes Ariel Mortman, Finn Roberts and Parker Stevenson who star in this series. The pace is good. It is well produced with good visuals, sound and cinematography. The storyline is a bit cheesy, but I am hoping that there will be an interesting rivalry develop between the two houses, similar to what happens in Harry Potter houses. We will have to see how that all rolls out. 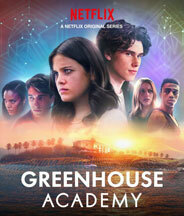 I recommend Greenhouse Academy for ages 10 to 15 and give it 4 out of 5 stars. It makes a great addition to any film festival looking for programming for tweens and teens. Reviewed by Angel U., KIDS FIRST! Adult Juror. After losing their mother, 2 siblings arrive ar a boarding school for gifted future leaders. They join two competing houses at school and become rivals. Soon, mysterious events draw both groups into a secret investigation and uncover a deadly plot to destroy the planet. They must come together to save each other.